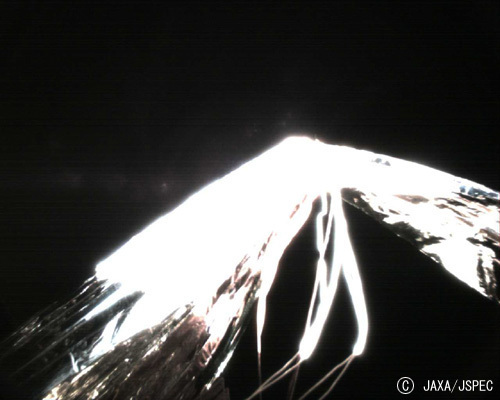 Several pictures from the sail deployment monitoring cameras showed up on the IKAROS blog overnight. Here's one of four showing what looks like good halfway progress on the "first stage" of the deployment, when the tip weights were midway through pulling the folded sails outward. Lou Friedman tells me these were taken a couple of days ago. 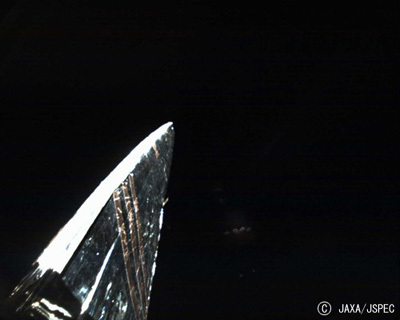 A view from one of the four sail monitoring cameras on IKAROS shows the folded sail being pulled outward from the spacecraft as it should be. 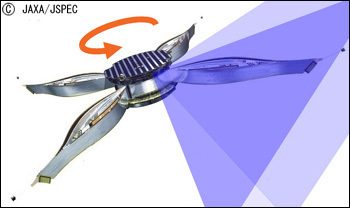 And here's a helpful diagram showing (in blue) the field of view of one of the cameras. You can visit the blog to see the views from the other three cameras. This is a view from one of the sail monitoring cameras on IKAROS on June 9, 2010, following expansion of the sail. On first glance, it looks like something has gone wrong, like a sail has kinked in half and two tethers have gotten tangled. But after comparing the view to the artwork of the solar sail (see below), I think that the photo actually shows things looking as they should. We're looking at the sail with a very foreshortened perspective from a very wide-angle camera, much like the way the rovers' Hazcams see fish-eyed views of the terrain in front of them. There's a square hole in the center of the sail, and that occupies most of the foreground, with two tethers floating in that space, not yet pulled taut; one pointy corner of the square sail is in the far distance, washed out in the bright sunlight. We'll hopefully get a better view of the sails once they activate their two deployable cameras, which should obtain a less severely foreshortened view. Anyway, this looks like great progress for JAXA! 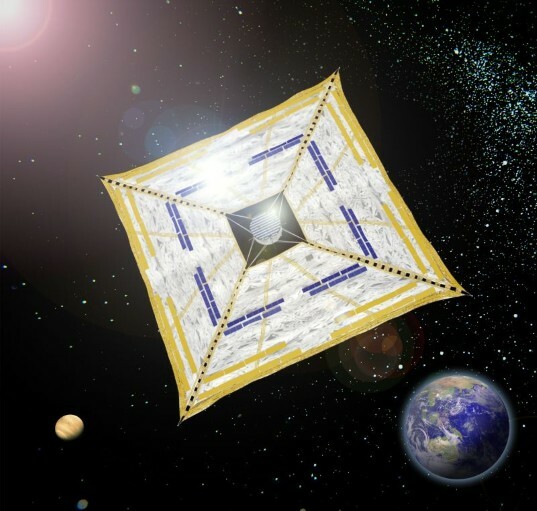 IKAROS (Interplanetary Kite-craft Accelerated by Radiation Of the Sun) is a solar sail which gathers sunlight as propulsion by means of a large sail. This spacecraft will be launched in 2010 together with the Venus Climate Orbiter, "AKATSUKI"(PLANET-C), using an H-IIA launch vehicle. Reader Lionel Ward helpfully provided a translation of the explanation posted with this image: "These are photographs taken after yesterday's completion of primary deployment. Due to intense sunlight, in the photograph there is the appearance that the two tethers connecting the sails to the probe's body are piled on top of each other. However, since the side of the sail close to the probe's body is in shadow, and the incident light there is weaker, we can confirm that the tether and membrane harness are photographed.